Item shown above : Wine NOT INCLUDED. DisplayGifts hand-made natural pine modular wine rack. 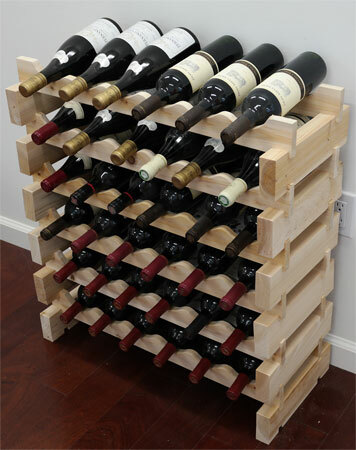 Our stackable modular wine racks are the most versatile and can be easily assembled. No tool is required, takes only 5 minutes. The unfinished pine wood allows you the option to stain, paint, or varnish. This configuration is for the 36 bottles wide by 6 shelves high racks, giving you a total storage of 36 bottles. (wine bottles shown in the pictures are not included).